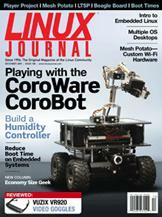 Programming mobile robots to interface with sensors, actuators and robots. The common parts that go into an embedded Linux system. The years fly, but the seconds can drag on forever. Everybody loves a good Spud! Access Ubuntu, Windows, Mac OS and Citrix from the same workstation. Doc Searls' EOF Is “Open Phone” an Oxymoron?